Church doesn't have to be awkward. That's why you can easily check us out right here before you ever walk through our doors. Click below for Video Messages (Sermons) or Events. The Ranch Church is a place where every child has a church. There's lots of fun to be had at Ranch Kids where every week, our leaders pour into the next generation - raising up world - changers who love God and His house! Plus, Sunday will become your family's favorite day and Ranch Kids a place they never want to leave. Classes for all grade levels with a Nursery, PreK-K, Grades 1-3 and Grades 4-6 offered. Classes begin at 9:30 every Sunday. The Ranch Church believes in developing Connections within the church as a primary way to spread the Gospel. Connection groups strives to connect people with each other through small groups of 8 - 10 people who gather together to discuss the weeks sermon and through a list of questions develop relationships and understanding of the Gospel. These groups are called Life Connections. In addition, The Ranch Church has other Group Connections to help further the relationship among the members of the congregation who gather to discuss various scriptures. Check out the Connection Groups below and be welcomed to a growing family. 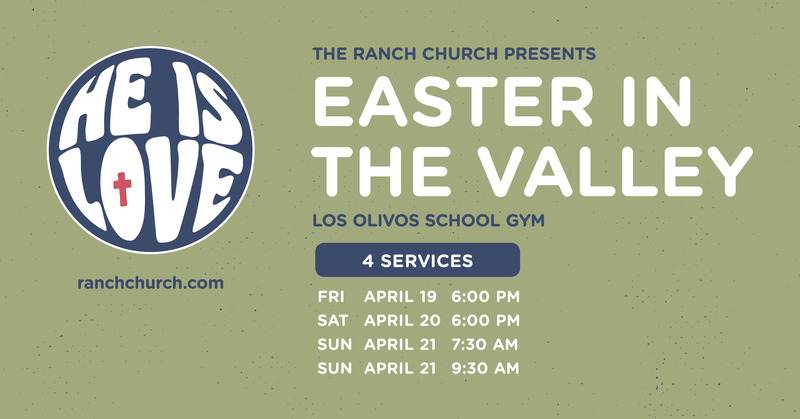 The Ranch Church is not just a place to meet each Sunday, but a church that spreads the Gospel through Missions around the world and Ministries here in the Santa Ynez Valley. The Ranch Church App is a place to find so many resourses about our church, and ways to stay connected. While this website is designed to stay static and constant, the app is constantly being updated by our staff to bring you the most relevant information for your walk in faith, and involvement at the Ranch Church.